When I first saw this pin, from Janette at Style with Cents, I envisioned it in my house. I wanted it right under this window, which faces out onto our screened porch/backyard, and I wanted it with seating for two. 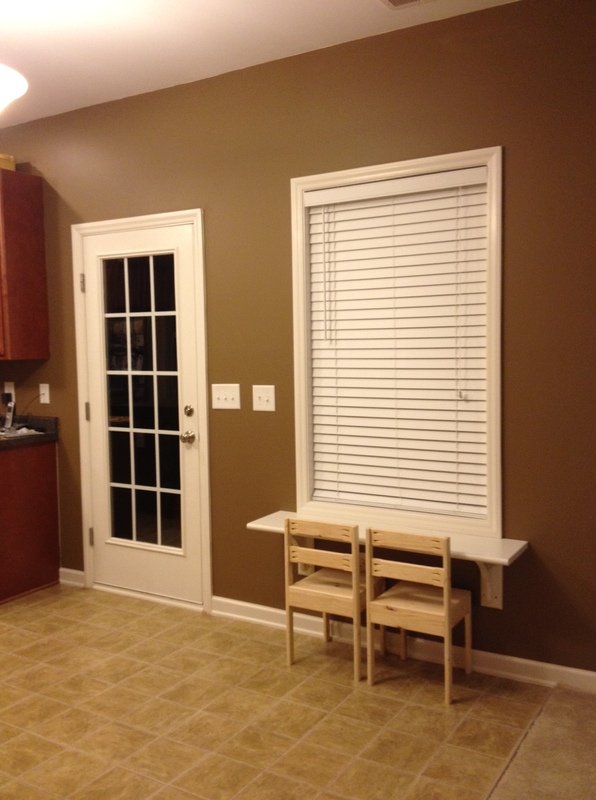 The window is in the “eat in” portion of the kitchen, which we have open right now to allow for His Majesty to hoop it up with his Little Tykes basketball hoop. He’s energetic. Rather than fight it, we make it work. We eat at the island, or in the formal dining room, and give him the run of the family room and all of the kitchen on one side of the island. Our kitchen table currently lives in the garage. We’ll bring it in someday. I’m not in a hurry. 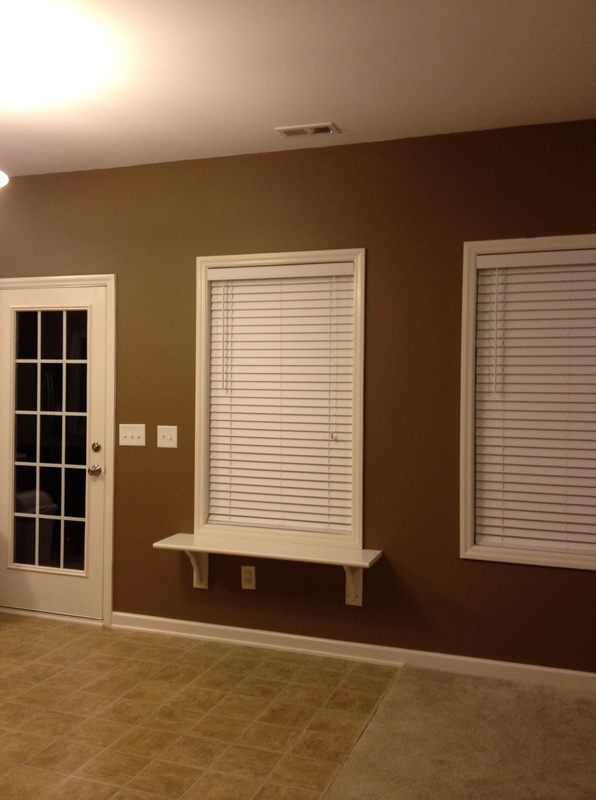 Anyway, I thought the little shelf desk concept would work out great under this window, and my sweet husband agreed. He went to Home Depot with the intention of getting a 48 x 12 shelf board and some shelf brackets. He came home with shelf brackets, but no shelf board. Because he’d found something better while he was there. A stair tread is thicker than a shelf board (1 inch thick vs. 3/4 inch thick) and the edge was already rounded, eliminating sharp corners and taking away the need to router the edges. And it looked like a shelf board to me, so I had no complaints. 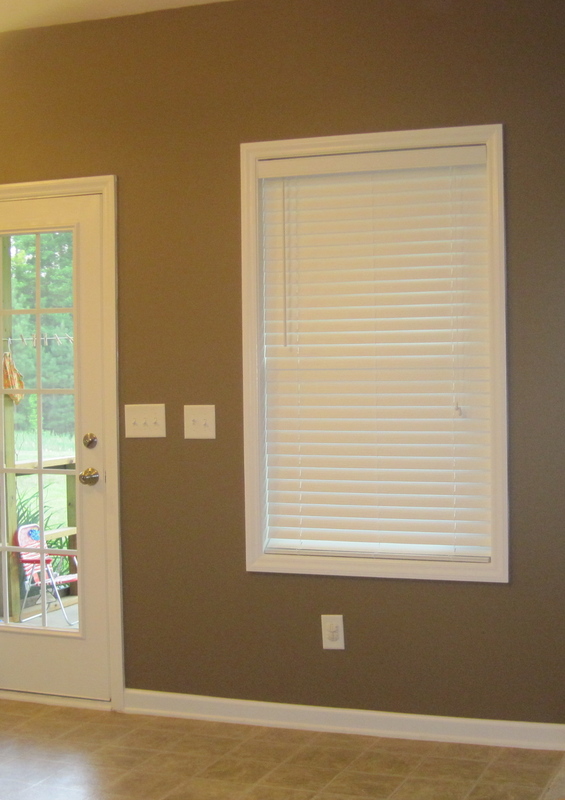 He painted the tread and brackets with three coats of the same white paint as our trim, and then got to work hanging it up. 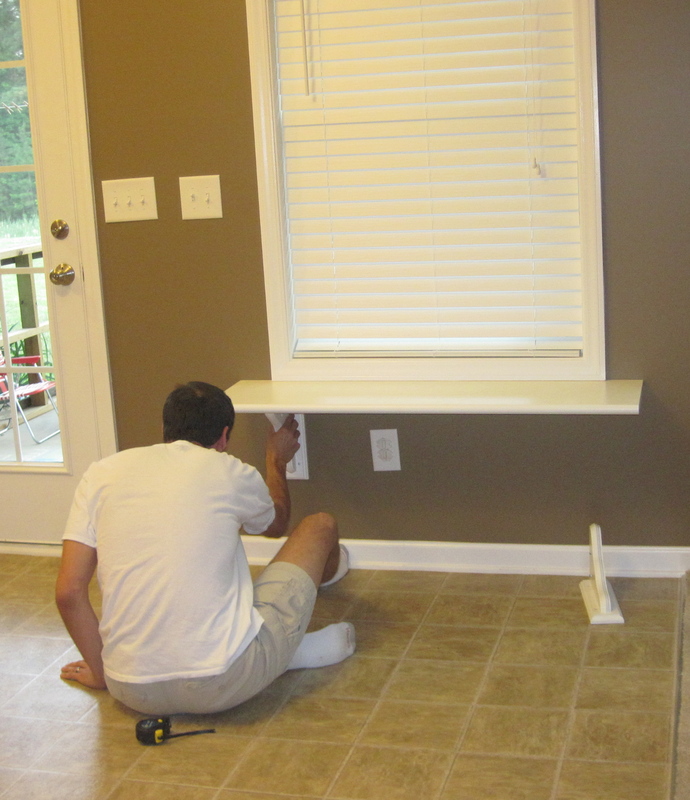 Because he positioned the brackets underneath the windows, he was able to secure them into wall studs, increasing the sturdiness of the desk. And then we got to work finding kiddie chairs. We looked online at Ikea. We looked online at Target. We looked online on Amazon. And then we found these plans from the amazing Ana White. She’s pretty much my hero, and her plans have enabled my husband to build me all sorts of stuff. 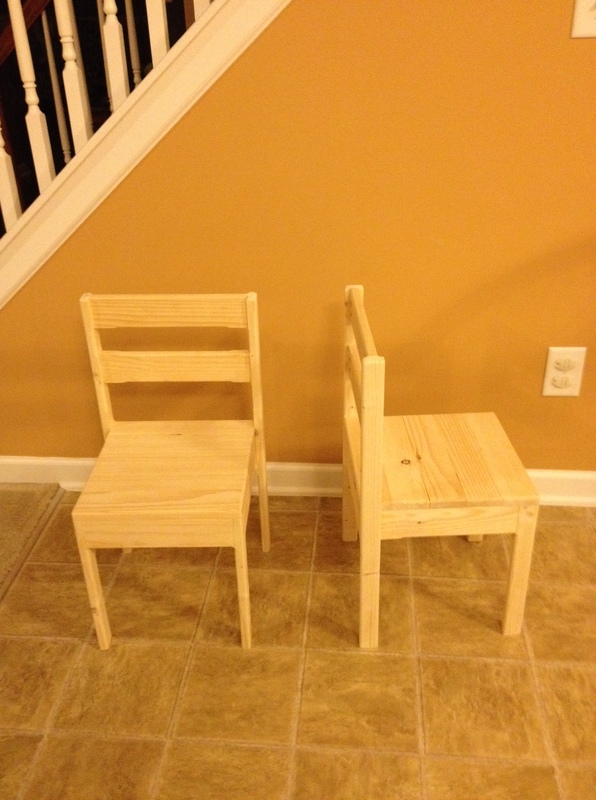 The next day, he built these two chairs in about 2.5 hours, at a total cost of around $20. Now the biggest decision we have to make is what color to paint or stain them. I am debating whether to keep them white like the shelf, to stain them to match the cabinets, or to do them in a bold accent color. But for now, they’re just bare wood, while I make up my mind. His Majesty now has a place to color, eat a snack, sit with a friend, etc, that doesn’t require him to be confined to his high chair, a fact that he definitely appreciates. If we decide to homeschool him, he will have a place to do his lessons that keeps him near me while I go about doing my work in the kitchen, and keeps Christopher from being distracted while he works up in the office. But for now, it’s just fun, and functional. But I need to decide on a finish for the chairs. What do you think? Bold accent color? Simple white? Matching stain? I am going to need some help deciding.